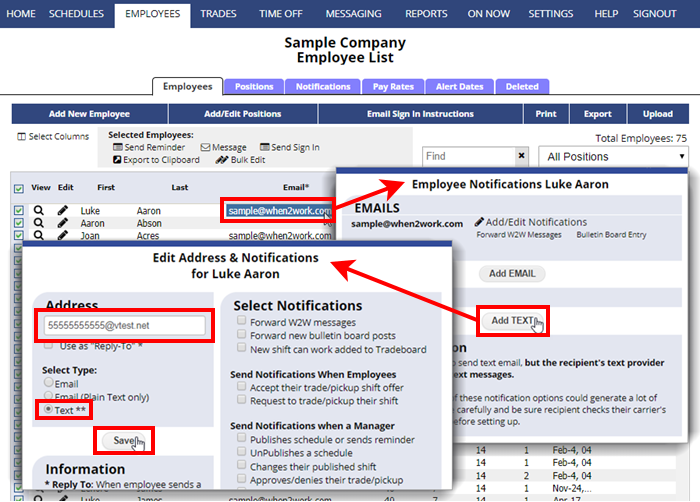 NOTE: the “Cell Phone” field for the employees is NOT related to their text notifications. Text notifications must be set up separately through the notifications section. To send a text message, you need to know the person’s “text message address” which is usually their cell phone digits @ the cell carrier’s domain address. Ex. 5555555555@vtext.net You will need to ask each Employee to enter their own text address or have them find out from their carrier what their address would be. The best way to find out your text email address is to send a text from your phone to your email and then note the “from address” in that email. We do not charge to send, but the recipient may be charged to receive text messages – note that some of the notification options could generate a large volume of text messages – so choose carefully and be sure to check the carrier’s charges and limitations before setting up.